San Antonio, TX - July 19, 2010 - Rackspace® Hosting (NYSE:RAX) today announced the launch of OpenStack™, an open-source cloud platform designed to foster the emergence of technology standards and cloud interoperability. Rackspace, the leading specialist in the hosting and cloud computing industry, is donating the code that powers its Cloud Files and Cloud Servers public-cloud offerings to the OpenStack project. The project will also incorporate technology that powers the NASA Nebula Cloud Platform. Rackspace and NASA plan to actively collaborate on joint technology development and leverage the efforts of open-source software developers worldwide. LONDON (Reuters) - New software by startup company ALGO Technologies offers to cut trade execution time to levels close to the speed of light, giving exchange clients an edge in the high-frequency trading arms race. I recently started dabbling with building iGoogle "gadgets". If you aren't familiar with iGoogle, it's a service from Google that allows users to create a highly personalized web-based portal with various pieces of news, weather, content, and a slew of other types of web-based applications in one handy location. It's the first place I go each morning to view my local news, check the weather, monitor stock prices or even kill time playing silly online games during the long train ride to work. If you're a serious application developer, iGoogle provides a robust platform on which you can build some pretty sophisticated web-based applications. With an estimated user-base of 25 million users, it's also represents an intriguing business opportunity. Interested in my iGoogle gadget? Click here. platform for developers to write Web applications and unleashing the creativity of programmers for the benefit of the masses. Google clearly has the clout and money to pull this off but can they build something compelling enough to get millions of users to switch to a new OS? I would certainly be willing to explore a new operating system developed by Google but I'm also unwilling to give up the familiarity of Microsoft Office and the other day-to-day tools I use to do my job. Yes, there will be substitutes for most of those products but the fact is that they will probably be pale in comparison. A good example is OpenOffice -- a great office automation package but, I'm sorry, it's a long ways away from Microsoft Office. So, Google has a pretty tall order in front of them and they'd better be in it for the long haul if they have any hope of success. hat their unique situation isn't a fit for a standard process and the change is being forced on them sometimes without consultation or consensus. An interesting article, by David Anderson, about making the "Agile Transition". At my workplace we're in the early stages of making this same transition. As an executive sponsor, it's something that I've generally approached in systematic way as a formal initiative. David's article suggests an alternative approach focused on the organizational culture. It's worth a read. For me, the verdict is still out on the best approach. I'm inclined to marry both the encouragement of cultural changes along with a a bit of a prescriptive approach. e of those variables include things like the quality of the software requirements; the level of collaboration from the business sponsor; the availability effective development environment; etc. Yet, every sizable software development shop seems to both their star players and those that seem to fall short. online. You’ll find that there is no shortage of opinions on this matter, from folks that want to measure the number of lines of code per hour to those who claim it can’t be adequately measured. Subjectivity is part of the equation – If you were hoping for a purely objective way of measuring a developer’s performance, forget it! Programming is both science and art, and it’s the artistic quality that will always be subjective. That’s ok! If you’re a manager, you should understand that agreement is not necessarily part of the equation. However, you do need to be able to express what you like and don’t like about their work in a way that will allow them to take corrective action. There are things you can measure – It’s not all art! For example, if you set an expectation that developers will unit test their code, that’s a pretty black & white measure. They either did it or they didn’t. As to the adequacy and quality of their testing, well, that’s a different story – subjectivity again. Did they complete any required documentation (e.g., design docs)? 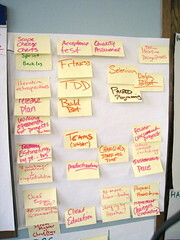 Hard deliverables, such as documentation are easy things to measure. Setting clear expectations is critical – If you require your developers to do unit testing or prepare certain documentation, then tell them! Better yet, put it down on paper and share your expectations with the entire team. Make sure your team understands exactly what and how you are going to be measuring their performance. Provide near real-time feedback and document – When an employee performance well, tell them! When they don’t perform well, tell them! Simple, huh? I suggest, particularly when correcting negative performance, that you document things using e-mail or some other written mechanism. If you have an individual with chronic performance issues, having written documentation is essential if you every reach the point where you are making a termination decision. I also can’t stress enough how important the “real-time feedback” aspect is in this process. If you wait more than about 24 hours to provide feedback, the effectiveness is greatly reduced. In the end, measuring whether a developer is able to consistently deliver quality work on time is essential. The trick is how do you hold a developer accountable for what is essentially an estimated level of effort? It’s an “estimate” after all?! It’s a tough problem and the key is to break things down to the point where most of the variables are in the control of the developer. If you’re measuring a developer on completion of tasks estimated to take more than about two or three days, you’re going to run into problems. Generally, the longer the duration the more uncontrollable variables that come into play – everything from dependencies on other developers to shifting requirements. One of the things I like about most of the Agile development methodologies is the way the team breaks down the work to be done in really small chunks, typically measured in days or hours. If a developer says they are going to finish implementing class XYX by tomorrow, that’s something I can measure them on and I can reasonably expect the outcome to be in their control. True, there are things that can still go wrong that isn’t their fault, but they are generally easy to identify and understand (e.g., their workstation crashed). If you’ve have some success stories or challenges you want to share related to measuring software developer performance, I’d love to hear from you! It’s a tough subject, with no shortage of opinions!